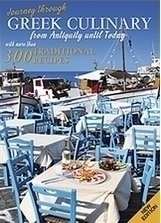 [...] Into the pages of this book you'll get to know some of the tastiest, the most aromatic and characteristic recipes from each corner of the Greek territory. The recipes are selected in such a way that they are easy in their execution. The quantity of the ingredients is calculated for 4 to 6 persons. Even traditional, these recipes are adapted in nowadays and correspond in the tasteful requirements of the modern consumer. Γράψε μια αξιολόγηση για το Journey Through Greek Culinary και βοήθησε σημαντικά τους άλλους χρήστες!